The four Divine Animals are afoot: Dragon, Unicorn, Phoenix, and Tortoise – the Divine Creature who “forgets” the rules of right and wrong. Hold on tight. Karol, the hereditary ruler of Layounna, vanished while hidden away with her lover, leaving her consort-husband to claim the throne. Shortly afterward, all the children in Layounna’s orphanages also vanished. Ten years later, Karol’s consort-husband claims an obscure young woman as a second wife, and she also vanishes. The consort’s mother and sister dabble in dark matters, including blood sacrifice and poison. Opposed to them are the country’s “unimportant” folk, including a silversmith, a disgraced adept, a shapechanging thief, a couple of kitchen maids, and at least one cat. Click here to read the Prologue and Chapter 1. 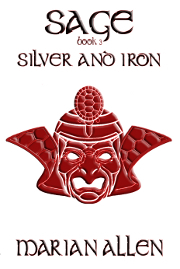 In the second book of the SAGE trilogy, memories, people, and items of power are recovered. The mighty are helpless, the weak are strong, and a little girl clutches creatures of terror to her ragged heart. 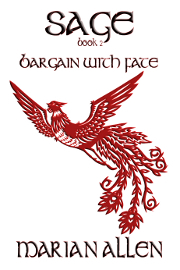 In the final book of the SAGE trilogy, the contention over the throne of Layounna is fought on strange battlegrounds: an island, a henyard, a scrivenry, a pocket, and the heart of the chief claimant. Click here to read posts about SAGE. This is the best blurb ever! 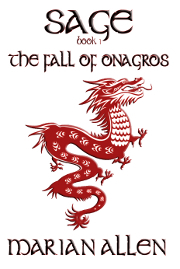 I got curious of this book “The Fall of Onagros”. Where can I grab a copy of this? Thanks for asking, Natalie! Click on one of the links under the picture of the cover for Amazon or Smashwords. Hope you enjoy it! Marian Allen would love to share..#Caturday — I’m RICH!